There are a few pieces on this list that I have no intention of picking up this year – they should be more correctly called UFOs – one day I may go back to them but I don’t believe 2012 will be the year that I do. Here’s a few pictures from today’s work. My study was in a bit of a state when I started but it is all ship-shape now. If only I could get the cats out of my stitching chair I’d be a happy girl! Let the stitching year commence! Wishing you all many many happy stitches in 2012. 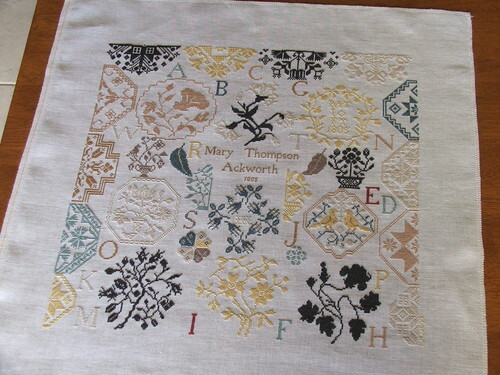 Hello all, as you can see I am rejoicing today – I finally managed to finish Mary Thompson’s Quaker Sampler this week. I started her as part of a stitch-along with some of my stitching girlfriends here in Perth. We started in January last year and my original aim was to complete a motif a week… she was put aside quite a bit poor lass, but I refused to call her a UFO and she was finally completed this week on Thursday night. She is stitched on Edinburgh linen with AVAS silks. She is absolutely gorgeous. I love her. I think I know just where to place her in my stitching room once she is in a frame. What games do Reindeer play? 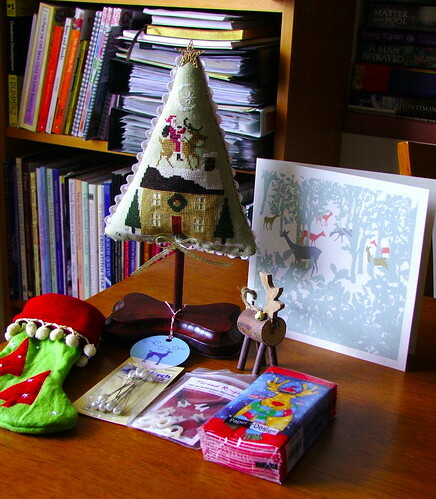 Reindeer Games Exchange for Lisa V! Well, it’s been another weekend full of catching up with friends, frenzied housework and family reunions. I even managed to squeeze in some stitching time (to my amazement I have pretty much finished page three – there are some swirls in the bottom of the right “spot” that I have not done because I would end up with a short length of thread. Janine assures me that this spot is symmetrical (she has the full chart as moderator for the group). Sorry, this is Spot Sampler Mystery 2008 by Stickideen von der Wiehenburg. 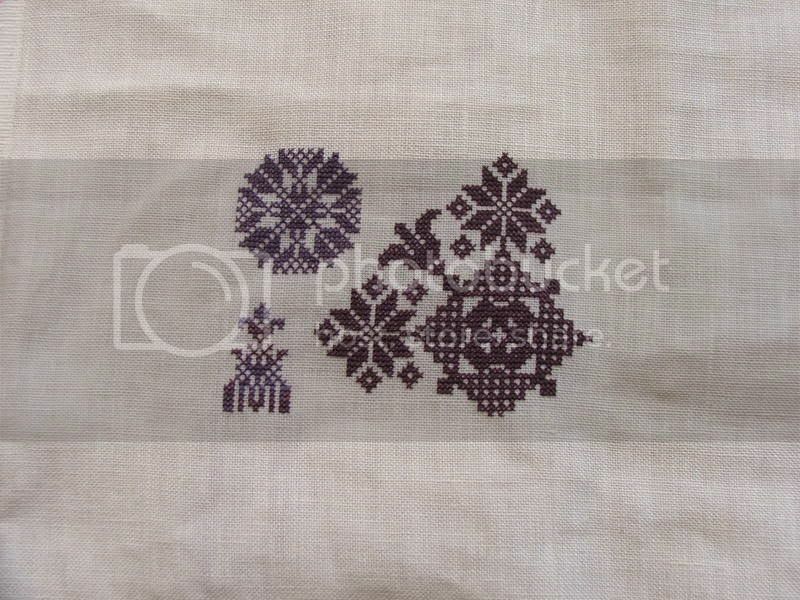 You can join the group here, the pattern costs 11 Euros. Yesterday I managed to catch up with some of my stitchy friends and had a major stash attack (the list is embarrassingly long). It was so good to see Diane, Janine and Susan again. We must do it again soon girls! While I was out playing, Joel worked on a project for work (yes, on a Saturday), did the shopping and did a couple of loads of washing (what a guy!). This morning we got a call from my sister in law enquiring if their family and Joel’s parents could come for lunch at ours (we were going to get together anyway). As we were expecting to go to theirs, Joel an I had to throw ourselves into top gear and vacuum, dust, and clean everything – house was in a bit of a state (neither of us were in the mood to clean yesterday). I am amazed we were ready when they arrived – the house looked lovely! It was great to spend some time with them – they are so nice to be related to! My niece and nephew were fun to play with as usual and when it was time to go there were tears because they didn’t want to leave!! Now it is ten to six and I am exhausted! I’m going to take some time out and read for a bit. Till next time, friends. 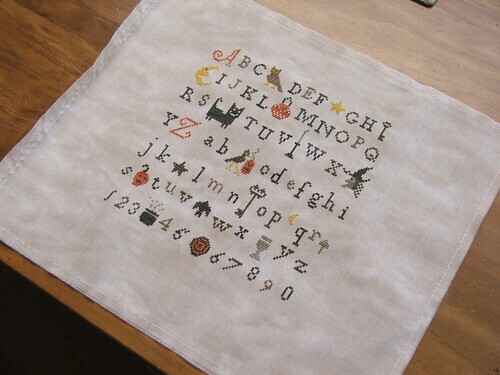 Here’s The Primitive Needle’s Hallow Sampler all done. 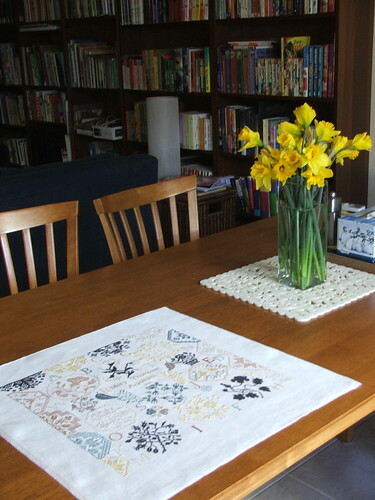 The fabric I have used is some 36 ct evenweave I purchased at a needlework show, very nice to stitch with. Stitched with the recommended fibres (wdw). I love how it looks finished. I’m planing to take this to a framer quick smart. And here’s my start on the Mystery Spot Sampler 2008 by Stickideen von der Wiehenburg (please excuse the crappy photo). I was so excited to hear this was starting this week that I immediately sent payment and asked Janine to send me some fabric to stitch it on (it’s 40ct cream newcastle). I’m using one of Vikki Clayton’s limited edition variated colours – a mix of violets and maroons – 1453/55/2125 and the solid colours that compose it. I’m thinking also of also including 2125/2115/1455 (a similar colour as you can see from the numbers) and the additional solid colour 2115. I think this combination will stitch up quite prettily. Till we meet next, happy stitching.